With rains relenting a bit on Saturday (16th August 2014), the festivities of Nanda Devi Rajjaat Yatra took off with a religious fervor when mythical four-horned sheep and the Raj Chantoli (a small palanquin with Nanda Devi’s small decorated idol) of Nanda Devi reached Kansuwa village near Nauti in Uttarakhand. Kansuwa is village of descendants of erstwhile royal family (raj kunwars) who have been traditionally organizing the Nanda Devi Rajjaat. Earlier both the sheep and the Chantoli were brought to the Adi Badri temple where they were received by the Kunwars of Kansuwa represented by Dr. Rakesh Kunwar who is also the president of Nanda Devi Rajjaat Yatra organizing committee. After traditional rituals and offerings, they were taken to Nauti. 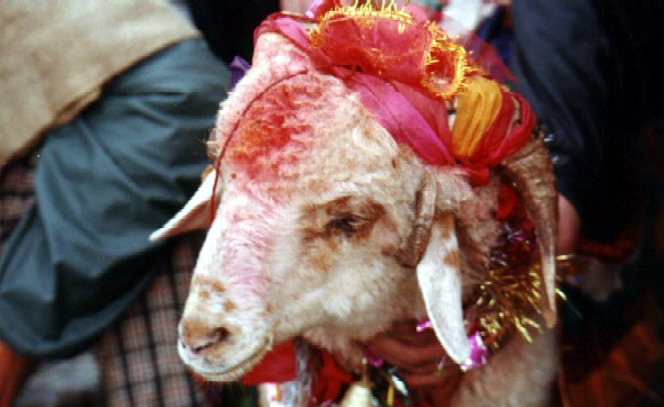 Traditionally the four horned sheep leads the Yatra followed by Raj Chantoli till Homkund, where it is released towards the Kailash Mountain mythically considered to be abode of Lord Shiva. Homkund is reached after passing through Bedini Bugyal, mysterious Roopkund and a very tough Jyura Gali pass (termed as street of death). Its also believed that this sheep is borned after special prayers by Kansuwa family. Its birth anywhere in the region is considered to be the permission to hold Yatra. The Raj Chantoli is built by Rudis of Chimta village near Kansuwa. It is brought to Adi Badri by the Rajrudia and handed over to Kunwars of Kansuwa. They take it to their village Kansuwa. On the way at a place called Madho Ghat the sheep encounters Raj Chantoli and then they go together to Kansuwa. A gold idol of Nanda Devi is kept in the palanquin (Raj Chantoli). After being decorated whole day on Sunday, the sheep and the Raj Chantoli will be reaching Nauti on Sunday night from where Yatra will finally leave for Homkund on Monday morning at 10.45 am with hundreds of followers in tow. As per information of now, Governor of Uttarakhand Dr. Aziz Kureshi will be inaugurating the Nanda Devi Rajjaat on Monday. He will be flying to Gauchar airstrip from Dehradun and after an overnight stay will travel to Nauti by road. Adi Badri is one of the Panch (five) Badris of Uttarakhand. Located 17 kms from Karnprayag on the Karnprayag-Ranikhet highway, this is actually a cluster of 16 temples believed to be built during the Guptas period. The 20 days, 290 kms Nanda Devi Rajjaat Yatra will culminate at Nauti on 7th Septembter. This year a day as been added in the Yatra for an extrra stay at Bedini Bugyal. (Nanda Devi Rajjaat Yatra from 18th). I loved this post. May I share it? Ofcourse Svetlana! You are absolutely free to do that. Thanks in advance!